In 2006 Community Visiting Nurse Association established a nursing scholarship in honor of the late Caroline E. Krajewski Manney (right). The scholarship is awarded each year to one or more students from Somerset or Warren County who are enrolled in a National League for Nursing or Commission on Collegiate Nursing Education accredited nursing program within the State of New Jersey and who have successfully completed at least one semester in an RN Program. The scholarship was established to honor Caroline Krajewski, who joined Community Visiting Nurse Association (formerly Somerset Valley Visiting Nurse Association) in 1961. Caroline brought her dedication, kindness and compassion for the field of nursing to Somerset Valley VNA for more than 20 years. 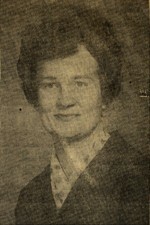 Her commitment to home care led her to the role of Director in 1968. Caroline started her career at Muhlenberg School of Nursing, where she developed a deep appreciation for public health, home care and teaching. She continued her education and obtained a Bachelor of Science degree from Seton Hall University and obtained her Master’s degree in Public Health and Nursing Administration from Teachers College, Columbia University. Caroline was a true believer in public health and home care, convinced that the home was the best place to recuperate. An advocate for the poor and underserved, Caroline was instrumental in initiating expectant parents classes. Working with the local departments of health, she helped initiate free health clinics for infants and pre-school children, providing medical care to those in need. Caroline Krajewski Manney was a true visionary, recognizing the importance of home care and community-based services in promoting the health of individuals and the community. The scholarship was created as a means to honor her dedication while helping to support individuals seeking to pursue careers in nursing. The Caroline Krajewski Manney Nursing Scholarship Award is presented to an individual, or individuals, who reside in Somerset or Warren County, are pursuing a career in nursing and who demonstrates dedication to the field of nursing and community health. This year’s scholarship recipient is Catherine Yorkgitis of Basking Ridge, New Jersey, who is pursuing a bachelor of science degree in nursing from St. Peter's University. Helping to present the award was, right, Carol Patterson, Associate Professor of Nursing, Raritan Valley Community College and current CVNA Board Chair. You may obtain an application for the 2019 award by accessing this link, and the winner or winners will be announced at the Community VNA Annual Meeting 0n May 8.